Today was my first day of exploring on my own. I was expecting some chaperoning, but Sandra’s boss is in town for the week so I took my Birkenstocks and my Lonely Planet guide (my first one as I tend to like Foder’s and Frommers better) and hit the “lu” (road). I was staying in south Shanghai's Xujiahui district near the Shanghai Stadium which was fairly modern with lots of conveniences nearby. 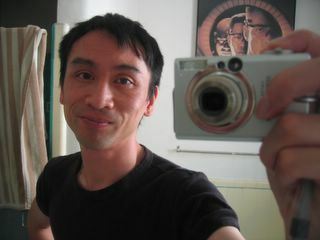 It’s September, but I can’t tell you how hot, sunny and humid (70%) it is in Shanghai. Sticky! And it was worse in August! My feet ended up with a ‘sandal tan’! Hahaa. I stepped out the door in search of breakfast and the Longhua Temple nearby and after 20 mins walking I realized the map and I were at odds so I decided to jump on the subway to make up lost ground. Say what?! Not reading Chinese nor speaking Mandarin the subway was going to be an experience :). But I always use the “watch, listen and do” rule. And it also helps if the ticket machine has a button saying “English”! All I needed to know was where I was (easy), where I wanted to go (easy) and which line I needed (easy). Three yuan ($0.40) later I was on the train which was the same as any modern subway system. And, in fact, there were many improvements to the subways of London, New York and Hong Kong. 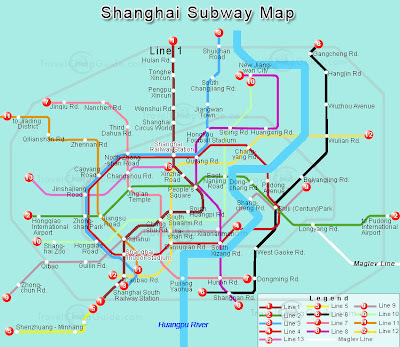 The Chinese are so proud of their subway that they've put about 4 lines on the map that haven't been built yet?! May be they're building so quickly it's as good as done, or they're embracing the resource-conservation idea and didn't want to reprint later?! After Longhua’s pagoda, insense sticks, prayers and serenity I jumped in a taxi to the Old Town that Sandra recommended, but totally forgot about the water features and buildings she wanted me to experience. Instead, I saw the old buildings and the back streets on the Lonely Planet walking tour. I was kinda keen to get away from the beaten track as there were loads of hawkers selling fake bags and Rolexes here for some reason?! As I was ready to leave – it was already 5pm - I found the Flower, Bird, Fish and Insect Market. It sounds cute, but you know it’s going to be upsetting: tiny terrapins in bowls climbing over each other; puppies caged and exhausted; parrots crammed into small cages. It made me wonder how a Buddhist community could really treat animals in this way for trade? I decided I could only take a picture of the bird cage maker as this was one of the only honorable trades here! After a short rest, Sandra came home and we hatched a plan for the evening. It was late before we skipped the French Concession for the Tai Kang Road gallery district favored by independent artists. Alongside these galleries are cosmopolitan cafes and restaurants. But for some reason I didn’t fancy pizza and pasta and the expats drawn to the Simply Thai restaurant made me wanna go onto the next alleyway. Eventually, we found a wonderful Tibetan restaurant. I can’t tell you how laid back (like being in their front room) and friendly these people were and how wonderful the food was. Aubergines stuffed with beef, Tibetan (curry) fried rice and the Tibetan herbs stir-fried in garlic and salt which looked very much like a lettuce but crunchy like seaweed. Wild! Our waiter grabbed a little guitar-type instrument and strummed a tune outside the restaurant and then came over with his buddy and three cups of sweet wine. Sandra translated: “he’s gonna to sing us a song to welcome honored guests!” Then he showed us how to honor our parents, friends and family with a Tibetan toast: “hold the cup in your left hand and dip your fourth finger in the wine and flick it above your head… three times!” Wild! After dinner we ended the night on a massage table getting one of the best knot-loosening kneads I’ve had. And for under $10! Late night massages seem to be de riguer here as massage parlours stay open till the early morning and are not for the drunken “happy ending” tourist. These parlors are for the benefit of the locals. I, of course, fell asleep for a minute :).